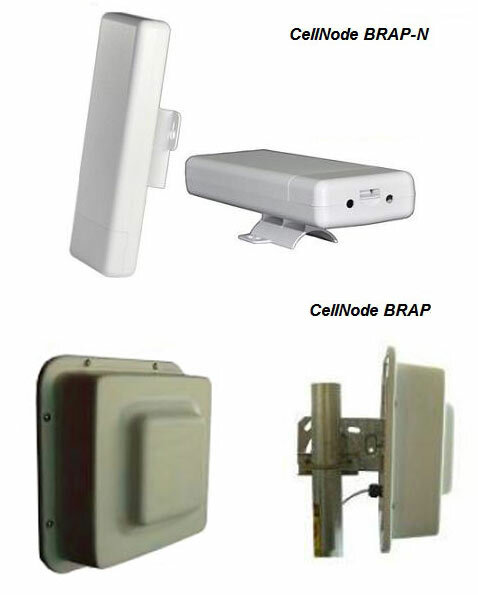 CellNode BRAP is an outdoor wireless bridge that allows multiple clients to connect to local or remote access points using 802.11b/g/n 300Mbps wireless links. The device can function in three modes: Bridge, Relay, and Access Point. In Bridge and Relay modes, CellNode BRAP extends the coverage of traditional access points by connecting multiple access points to a single fixed line (Bridge mode) or by connecting multiple access points to a remote access point (Relay mode). Additionally, CellNode BRAP can function as a traditional access point, providing network access to wireless clients. The device has an integrated 15db directional antenna that allows it to enhance its transmission range. CellNode BRAP is designed for outdoors installations and has a built in Power-over-Ethernet (PoE) connection that allows the device to be installed outdoors up to 210 feet (70 meters) away from the client computer or network switch without impact on performance. In Bridge mode, CellNode BRAP will relay all signals coming from its Ethernet port to its wireless port and vice versa. This functionality will allow connectivity between LAN and wireless networks. In that mode, CellNode BRAP can be used to connect multiple access points to a wired LAN. In Relay mode, CellNode BRAP extends the range of wireless networks. The device uses Wireless Distribution System (WDS) technology, allowing it to communicate directly with other access points. This way, a number of secondary access points can connect to a master access point via CellNode BRAP via wireless links. CellNode BRAP can also function as a traditional access point to provide wireless clients with access to wired networks.